reFresh Low Profile | S&P Canada Ventilation Products, Inc. These units feature high quality, efficient S&P backward inclined motorized AC or EC impellers. 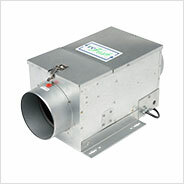 The full size units feature heavy-duty galvanized construction and integral metal duct collars designed for 6" round duct. There are 8 model options with and without S&P's exclusive ES24V control all units ship with 6' power cords. The Re-Fresh is designed for easy installation and maintenance, giving the homeowner the best IAQ solution in an all-in-one unit. Note: ES24V control mounted on the exterior of RF8 units.